Nic and I climbed Mt. 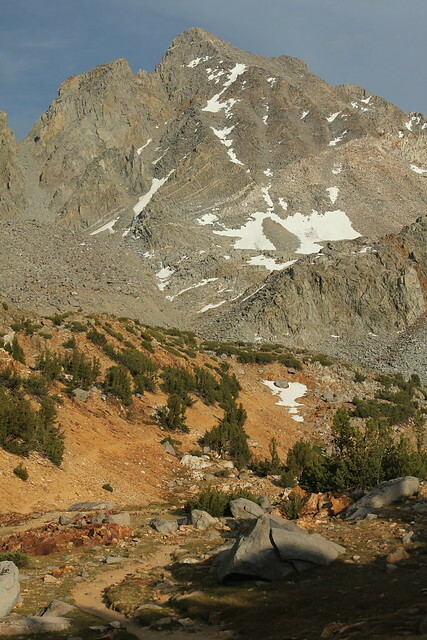 Agassiz in the Eastern Sierra Nevada on Saturday, June 29th. Nic is a more experienced climber, from many climbs in his native Switzerland to climbing Mt. 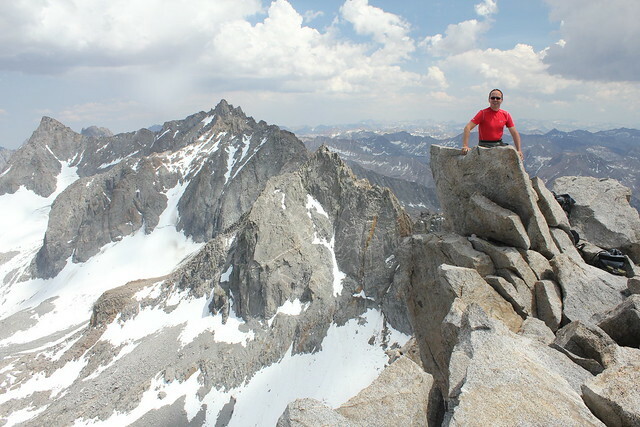 Whitney in California, but this would be my first time over 12K feet in elevation. Though neither of us had been there before, we decided that Agassiz would be a good combination of beautiful destination and challenge getting to the summit. We were not disappointed. 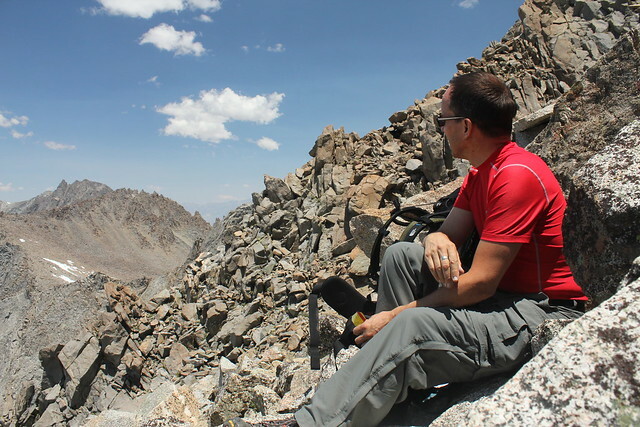 We drove out to Bishop the night before, to acclimate and get an early start on our hike. The next morning we hit the trail at 7:30 am, a little later than we had planned, but still it seemed like plenty of time. 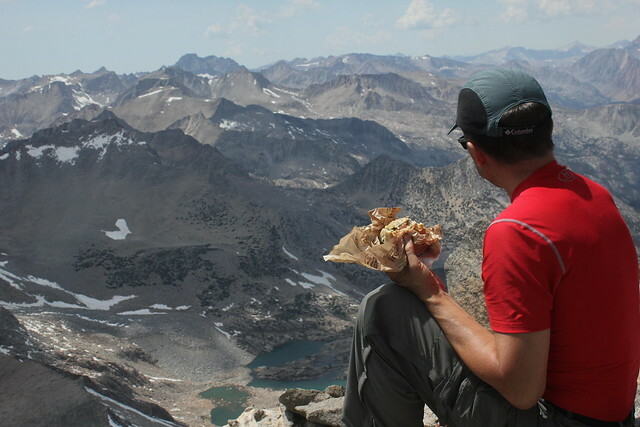 The first 6 miles of the hike were following a gently ascending trail, from about 9800’ to 11972’ at Bishop Pass. Getting to the pass was fairly straightforward. The only minor nuisances were the incessant mosquitoes and a a bit of light-headedness around 11K’. I was still doing fine, but I started to get some doubts about whether altitude sickness would prevent me from making it to the summit. We reached Bishop Pass at 10:50, a little longer than we had planned. (Nic had assured me it would be an “easy 3 hours”). But, so far the views of the mountains and the alpine lakes had been amazing, and we still felt good. At just under 12K’, Bishop Pass was equal to my previous highest altitude at Glen Pass, the high point of the Rae Lakes Loop. We took a short break, I popped some Ibuprofen to help deal w/ the altitude sickness, and we left the trail to begin the climb. Mt. 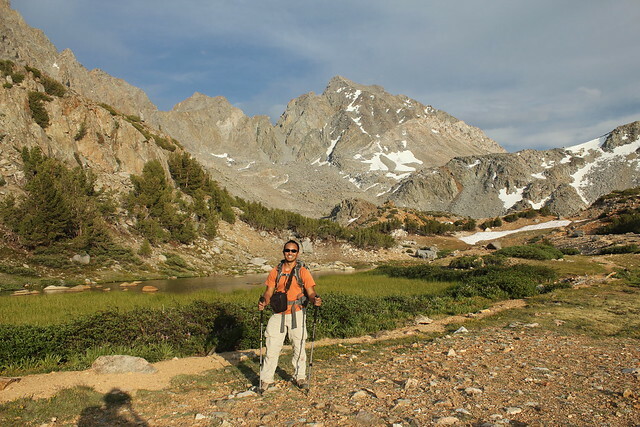 Agassiz is California’s 21st tallest peak. Its not quite a “14er” at 13,893’. But at 4235m, Nic said it met his metric for a formidable peak of anything over 4km, which was good enough for me. Supposedly the route up was “moderate scrambles with class 2-3 rock” – I had felt confident that I wouldn’t have any problems with climbing that grade rock, but I hadn’t appreciated just how much climbing we would do. Somehow I had imagined that it would mostly be straigtforward hiking, with occasional class 2 & 3 moves. Now I could see that we’d have class 2 conditions at least the full 3K’ ascent. Nic requested that I add a line explaining just how intimidating Agassiz looked from the pass. Actually, at first it seemed like just a pile of rocks. But when we noticed another group about 1/3 of the way up, at the bottom of a patch of snow, suddenly we became aware of the scale of the climb ahead of us. Suddenly we had a lot of doubts about our abilities to complete the climb, but we thought we’d give it our best shot. Just to be safe, I wanted to set a time that we’d turn around, no matter how close we were, to be sure we had time to get down and back to the trailhead before too late. Nic was sure that we’d be at the top no later than 2pm, but I thought we might need more time, so I talked him up to 2:30. Nic still felt confident we’d be back by 7:30. From the pass we scouted a chute which would keep us away from the snow and also avoid any sheer cliffs, and we began our climb at 11:10. We were making steady progress, but once we were climbing we could no longer see the peak; we couldn’t tell what pace we were keeping and whether we were on track or not. Regardless, our spirits remained high. After about an hour of climbing, the views were already incredible, and we felt really accomplished. Even if we turned around now, we would feel very satisfied w/ ourselves. Around 1pm we took a short break, grabbed a snack and took a few photos. We debated how far up we were, and whether or not we’d make it to the top or not. Parts of the climb had been tougher than expected – I’m no expert, but it definitely seemed more like class 3 in places to me. I didn’t think I’d run out of energy, but I was worried about time. Nic insisted that we’d be able to go down much faster than going up, and so we could let our timeline slip a little. I was actually growing increasingly worried about the difficulty of getting back down, and really doubted Nic’s estimates – but I figured we could even be back much later than 7:30 and we’d still be fine. Finally, at exactly 2:30, we reached the summit. It was sunny, warm, not windy (we were still in just t-shirts at almost 14K’!) and the views were unbelievable. Dusy basin to the southwest, our trail to the pass and Saddlerock Lake to the northwest, an uncountable number of peaks to the west, and a jaw-dropping view of the Palisades to our south. I kept my eye on some storm clouds to the northwest, but it seemed they weren’t heading our direction. So, we took an extended break on the summit, eating our lunch and taking a number of pictures. From this point on, I blame my stupidity on light-headedness from the altitude. We finished eating and started on our way down at 3pm. I could feel a headache coming back, so I took some more Ibuprofen and started the descent. Suddenly I realized that we had a number of storm clouds headed our way from the south. How had I completely missed them earlier? Clearly a storm was already underway, and it seemed to be headed towards us. My fears about climbing down the mountain were quickly confirmed – while it didn’t require the physical exertion of going up, taking large steps down on loose rocks was even more awkward than going up. Nic cautioned me to take my time, that an accident on the top of the mountain could be a total disaster. Not more than 15 minutes later, and only 200’ below the summit, I was making a large step down when a rock shifted slightly under my right foot. I had a firm grip on a rock to my right which prevented me from falling. But I lost my balance a little, and the shift in momentum caused my left leg to swing around to my right. Before I could stop it, my left leg struck the corner of a boulder just below my knee. Immediately a felt a pulsating warm sensation in my leg. No pain yet, but I figured I must be in shock. For a moment I panicked, thinking I had broken my leg on top of the mountain, with a storm approaching. I quickly realized how hopeless this situation was. It would be impossible for me to make it down on one leg, and there was no hope of getting help before nightfall. If I really had seriously injured myself, I’d have no choice but to tough the night out right there. But, a few seconds later, I realized there was no serious pain and I calmed down. In the end it was nothing more than some scrapes a bad bruise. I made a conscious effort to move my leg, to keep it from stiffening up, and then I gingerly tested putting some wait on it. A little pain, but it held up fine, so I continued my descent. Nic and I talked about my temporary panic, and just what we would do if we suffered a serious injury up there. How could I have been so stupid? In my defense, I can at least claim some altitude sickness. I had begun to feel light-headed about 5 hours and 3K’ earlier. I had no nausea, and though I was a little tired, I still had enough energy to keep going. But I was definitely finding it harder to stay focused. Keep in mind just how long we were climbing. We didn’t just need to keep concentration for one or two precarious moves – or even for an hour. We had already been at it for 3.5 hours (and we had another 3 to go to get down). Indeed, even after this accident, every 15 minutes or so, I would find that I had begun to zone out a little bit. Only when a rock suddenly shifted on me again would I realize I was being a little careless and curse myself. I’d try to concentrate very carefully on my movements, only to lose that focus again a few minutes later. The rest of the descent went relatively smoothly, with Nic occasionally having to wait for me to catch up to him. Luckily, the storm mostly went around us, though we did get some light hail for a few minutes. At around 12,500’, we reached the top of the last big snow field. We had gone around it on the way up, and that had been our plan going down as well. But Nic was interested in trying to glissade down. As Nic took a few cautious steps into the snow, I skirted around and continued going down over the rocks. I noticed that I was starting to feel much better, and soon I found myself outpacing Nic. A few steps into the snow, Nic had sunk through, and so he rejoined me on the rocks just to one side of the snow field, but now I was in front. As we got near 12K’, I started to feel really great. I could practically hop from boulder to boulder to now, I had so much energy and control. But I started to worry a little about Nic. Nothing was acutely wrong, but it seemed his effusive optimism had faded away. And was that poor judgement to even try to go into the snow? Should I have recognized that and stopped him from even trying? And then, WHAM! Just as I was mid-hop, about to plant my one foot on the next boulder, the rock under my other foot shifted a little and slipped out from under me. I fell straight down, with the full force right on my gluteus maximus. How could I have been that stupid – twice?!?! This time I felt the pain right away, but I quickly realized the full shock had been absorbed by my muscle. What dumb luck! I couldn’t have picked a better way to fall. Sure, it hurt, but it seemed I was still mobile. Even if I had fallen on my tail bone, it would have been massively worse. (Later my wife pointed out that my pack may have prevented any impact on my back.) Again, I gingerly tested my leg out, and it seemed fine, so I kept going. The craziest part was, despite the pain and the massive bruise I knew was forming, as we dropped altitude I was rapidly gaining energy. By the time we got to the base of the mountain, I felt like a million bucks. We actually reached the base of the mountain just when Nic estimated, 5:30. But though I was feeling good (despite my injuries), I could see Nic was clearly starting to wear out. We took quite a bit of time to admire the mountain from the bottom, take photos, refill water, and recuperate. By 6:45, we were only just below the pass. I knew we still had a long hike to the trailhead. But, even though Nic was still tired, his spirits picked up again after the rest. I knew we wouldn’t make it out by our original goal, but I figured we’d have twilight until 9pm, and could even complete the hike out by headlamp. As sunset approached, the light on Agassiz looked amazing, so we took some time taking photos and just enjoying the view. The mosquitoes returned as we hiked by the lakes, and soon we were just focused on getting out. It was an “easy” six miles, almost all downhill. At this point we just needed to summon the endurance to keep going. Sunset came around 8:30, but we had enough natural light to make it to the trailhead, moments before 9pm, 13.5 hours after we started. I have my full set of photos from the trip on Flickr. If you happen to read this to plan your own trip up Agassiz, I’d love to hear your comments. We found this blog post really useful. However, they didn’t warn us nearly enough about the difficulty of the trip down. We thought that we were fit and could match their 12 hours (or maybe even beat it), but we took a full 13.5. I’ve made some notes in the photos on flickr, pointing out the chutes we took up the mountain. I’d love to get any comments you have about how your trip compares to ours.